Results include both print and ebooks, available from Portland State Library and the Summit Libraries. While the Portland State Library has a large collection of books, articles, and journals, we may not have a specific item you are looking for. In that case, you may be able to get it through Summit or Interlibrary Loan (ILL). Summit is a cooperative or partnership of academic libraries in Oregon, Washington, and Idaho that share books. It takes approximately five days to receive an item through Summit. Items that are not available at PSU or Summit can be requested through Interlibrary Loan. It takes up to 12 days to receive a book through Interlibrary Loan. If the PSU Library does not have a journal article that you need for your research, request it through Interlibrary Loan. It usually takes two or three days to receive an article from another library. Find books on your topic by using a keyword search to find relevant subject headings. 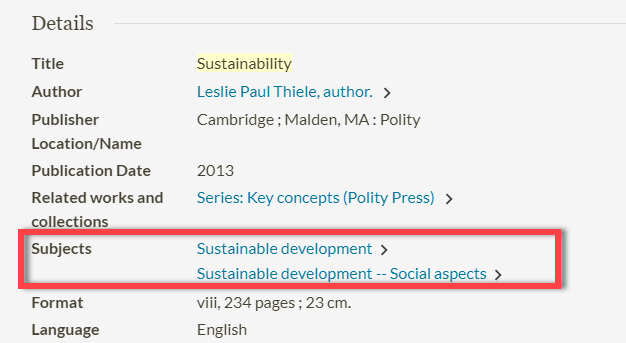 For example, search the keyword, Sustainability, in the PSU Library catalog. Under the details for the book entitled, Sustainability, the subject headings lead to other relevant books on this topic. The Subject links in the left-hand column provide pertinent results too. Maintains citations, abstracts, and full text of dissertations from 1997 to the present along with citations and abstracts for selected masters theses from 1962 to the present. Includes subject, title, and author indexing to U.S. dissertations from 1861 to the present. Portland State University's Digital Repository, PDXScholar, preserves the University's research, unique resources, and other scholarly output with the goal of providing persistent, access to that work.